Whether it's the expense, technical ability required to play it, or sheer number of strong arms and wheels required to cart the damn things around, the harp hardly gets a look-in when it comes to contemporary pop. This is a shame, as it results in those who play it being imprisoned as if by the many strings of their instrument with the words "Joanna Newsom" hammered on the cell door. Argh, see, I just did it! 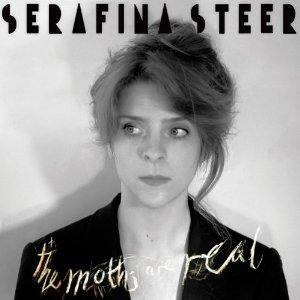 Serafina Steer's previous albums Cheap Demo Bad Science and Change Is Good, Change Is Good and excellent live outings boded well for this third album, The Moths Are Real, a brilliant culmination of the harpist's work to date. Jarvis Cocker was such a fan of Change Is Good, Change Is Good that he stepped up to produce The Moths Are Real, on which Steer is joined by a supporting cast of musicians including Capitol K, big-haired Polar Bear drummer Seb Rochford, The Flying Lizards' David Cunningham, Simon Bookish and Pulp's Steve Mackay. There's little to fault here. Steer's clear voice, with its occasional, quite unplaceable regional burr, is one of the finest updates of the British folk tradition we've heard in years. This is never twee, but witty, subversive and at times sensual, the power dynamic between male and female, dream and reality hard to place as Steer's voice arches and meanders over the melody. Opening track 'Night Before Mutiny' works as a feminine reversal of the sea ballad tradition ("They left me here with the ship to sink / Queen of a wide open sea / I kissed the captain / but the cabin boy was the one that did for me"). Interestingly, as well as the dynamics of the English songbook, the closest reference point to 'Night Before Mutiny' is Leonard Cohen's 'The Stranger Song'. Cohen is one of the strongest influences throughout, whether it's in the string arrangements, the "oooh oooh" backing vocals or bouncing jews harp in 'Lady Fortune'. Not only are these songs some of the most intricately woven pieces of pop you'll encounter this year, they also go to so many different places. The impressive array of avant-pop musicians she collaborates with bring in new textures, such as the lo-fi electronic pop beats in 'Machine Room', or 'Disco Compilation', in which Steer picks apart "A scanty life philosophy / based on lines from songs" before it rather unexpectedly becomes a bit of a throbbing banger, as if Steer were celebrating the departure of an unwanted lover. It's to Cocker's credit in his first outing as a producer that he manages to make all this mesh so well. What makes The Moths Are Real such a, well, lovely listen is just how unforced this all is - not out of twee naivety, but by a brilliant sense that these songs are their own worlds, telling their own stories, with a bit of a twist - see the celebration of illicit voyeurism in 'Skinny Dipping'. This is far from twee, as Steer tries to get a good eyeful of her swimming partner's dangling tallywhacker. Then there's 'The Removal Man', with its booming backing vocal turn from Cocker, and rhythm made of organ and horror film breakdown. It deals brusquely with some idiot who puts Steer down ("you call my cathedral a chapel") and sounds like a bit of a git, all round: "You hate my friends / yet you fantasise about them as well". There's also the line "My removed patch / my arse", which is cracking even if I'm not entirely sure what she means. In other tracks, the lyrical imagery is satisfyingly vivid. In 'Machine Room' Steer imagines herself "In my boiler suit and hard hat" tinkering away at a metaphor for mind, love or romance. In the rolling 'Alien Invasion' Steer looks up at the sky, possibly with a chemically-altered mind, and ponders being swept away by... but only by the right sort of little green man. There's a bit of misconception that around Quietus HQ we're all sat about off our noggins on rare powders, biting the heads off indie bands, and self-flaggellating with offcuts from Blixa Bargeld's scrapyard. This couldn't be further from the truth - fact is, we're just so rarely presented with an album that manages to make smart and unusual pop as refreshing as that found on The Moths Are Real.